One user started getting this ‘There was an error opening this document. 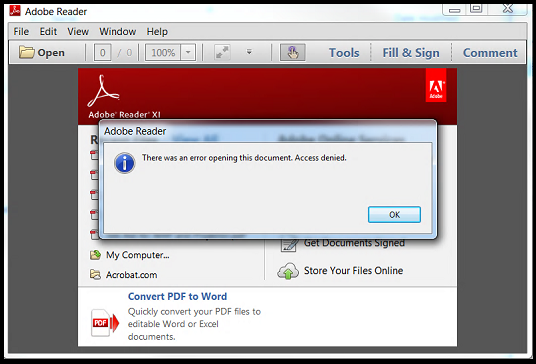 Access denied‘ adobe reader error while trying to open any PDF documents downloaded from any SharePoint site. This error shows up irrespective of level of access in SharePoint. Word documents, excel workbooks and all other office documents open up in office client in editable mode without any issues. Pdf documents open up normally in browser without any errors. Only issue was when you try to download pdf and try to open it with Adobe reader. After spending good 30 minutes on google, we are able to figure out the reason. This is because of Protected Mode(PM) security setting in Adobe Reader. This was introduced with Reader 10.0 on Windows. There are ways to disable this setting by turning off a windows regiestry key through a GPO. Anyways after disabling the ‘Enable Protected Mode at statup’ under Sandbox Protections, user is able to open pdf documents without any issues. 3. 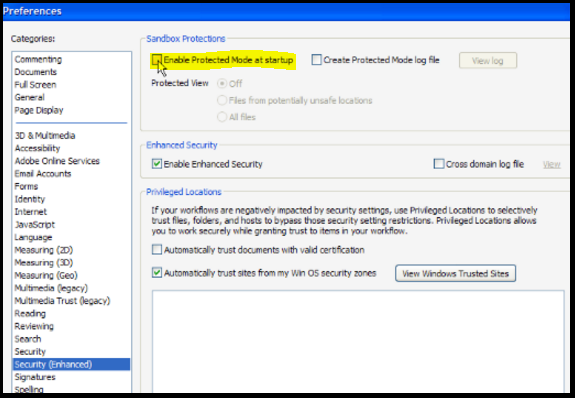 Uncheck the Enable Protected Mode at startup check box under Sandbox Protections. 4. Confirm the change and select OK. This fix worked for me and may not necessarily be an ideal fix for everybody else. Please make sure to understand the implications of turning off this protection.